"Regina Laudis is a monastery of contemplative Benedictine women living in union with the Roman Catholic Church and following the Rule of St. Benedict according to the Primitive Observance. Founded in 1947 in Bethlehem, Connecticut by the late Mother Benedict Duss. "Regina Laudis was elevated to the status of an abbey in 1976. The community of Regina Laudis is presently made up of 40 women, representing a wide diversity of personal and professional backgrounds. "Regina Laudis means Queen of Praise. Our prime mission as contemplative Benedictines is to pray the Divine Office or Liturgy of the Hours, keeping the prayer of the psalms resonating through the day and night, every day of the year. "In order to give ourselves as fully as possible to the mission to pray without ceasing, we live and work within the enclosure of the monastery. The enclosure, marked by physical walls and grille work in certain locations, functions like the permeable membrane of a cell wall that allows life to flow in and out. The stable but essentially dynamic character of our monastic life is determined by the constantly interpenetrating rhythms of prayer, work, and study." "Formation at Regina Laudis follows the classical stages of Postulancy, Novitiate, First Vows, Perpetual Vows and the reception of the Consecratio Virginis, the ancient Rite of Consecration to a Life of Virginity. 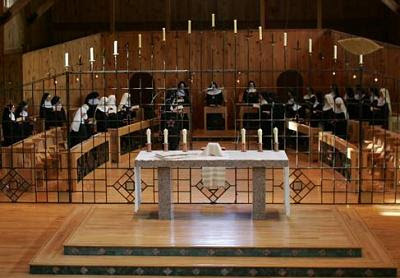 Each nun takes the uniquely Benedictine vows of Stability, Conversion of Life and Obedience: Stability, binding her perpetually to this particular monastic community; Conversion of Life, obliging her to choose every day to re-center herself in God through the community; and Obedience, by which she pledges fidelity to the authority of the Abbess and all those delegated to take responsibility within the 'school of the Lord's service.'" They are not kidding when they say they represent "a wide diversity of personal and professional backgrounds." Before entering Regina Laudis in 1963, the Prioress was a Tony Award nominee who had co-starred in two movies with the late Elvis Presley, the legendary King of Rock and Roll.